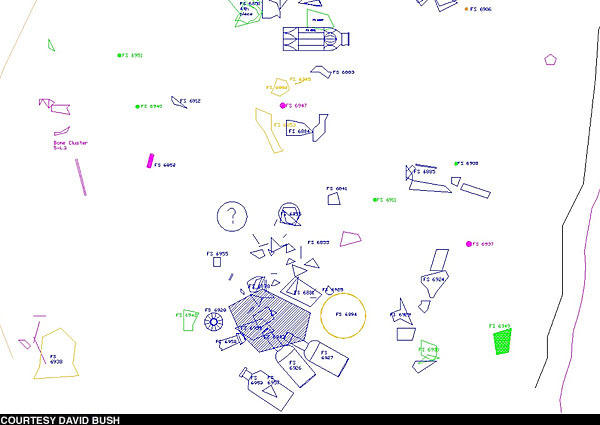 This is a partial map (using Autocad) of some of the cultural materials removed from Feature 41. The cluster of three bottles at the bottom of the map represents two ale bottles with the crown embossing and a medicine bottle. The other bottle discussed is drawn in at the top of this map. We have been working quite hard this summer to investigate Feature 41, the prison hospital latrine from 1863, and have taken many interesting things out. I wanted to share with you these new discoveries at Johnson’s Island. We have found so much eggshell that I can’t even imagine how many eggs it must represent. I don’t think I can get a student to try and figure out the minimum number of eggs. Unfortunately, one part of an eggshell looks pretty much like any other part. With bottles, there is only one finish (the opening) and one base so it is much easier to determine how many bottles are represented by the collection removed. With bone, we examine the articulating ends to determine a minimum number. But with egg, we can only say that we have what appears to be hundreds. Eggshell exposed in Feature 41. Notice how the egg to the left looks nested, as though they put several eggs together after cracking them open and using them. 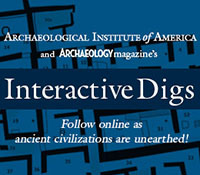 It will take us months to go through all the finds from Feature 41. We have a porcelain plate that I will report on later which is quite unusual, as well as a beautiful 12-sided umbrella style inkwell. However, for this report, I would like to talk about two bottles that we recovered from the latrine which seem quite unique. The first is an ale bottle that has one crown embossed on the shoulder. We have now recovered two of these bottles this year. It would be great if we understood where these bottles came from, assuming that the crown embossing represents a single bottling company. The other bottle of interest here is a fairly large (9 inch) bottle with decorative shoulders and base as well as eight panels for the body. The finish (mouth of the bottle) was applied and it has the appearance of being a possible food storage or milk bottle. However, I have been unable to find any examples of this style of bottle in any reference material at hand. It is the challenges like these that truly make exploring these hospital latrines exciting. I will look for suggestions on the identification of these bottles in the forum section. I will be reporting on more at we get through the many artifacts recovered. Left: This is the only style of this bottle that we have recovered from Johnson's Island. It appears to be some type of possible food storage bottle, but I have yet to find a specific example of this in any reference materials. Right: This is a picture of the ale bottles that came out of Feature 41. We have yet to identify what the embossed crown represents, either the bottle manufacture or contents. This entry was posted on Sunday, July 29, 2007 at 11:27 am	and is filed under Field Reports. You can follow any responses to this entry through the RSS 2.0 feed. Both comments and pings are currently closed.